Great review! I have a lot of the same thoughts about these shoes after running in them. They are my “go to” shoe for the winter… especially snow… they seem to love compacted snow 🙂 Going to post a link to this on my FB page…. good stuff! Thank you for sharing me, Jeff! You like yours too, huh? I was really impressed with them. I do.. but like you, I like my Merrell Trail Gloves… going to post up a comparison, but in many cases they are very different shoes… wish I could morph them together for the best parts! Wow what an awesome review!! Thank you for this. I’ve been looking for a winter shoe for days when I can’t wear my Komodos, and couldn’t decide between all the Neo models. This helps immensely!!! Glad I could help. Thanks for reading, Maria! Maria – if you choose to buy these, I’d very much appreciate it if you reach their site by clicking in one of the links from this blog post or the banner to the right. Thanks! I love the Luggs at the bottom of these things. 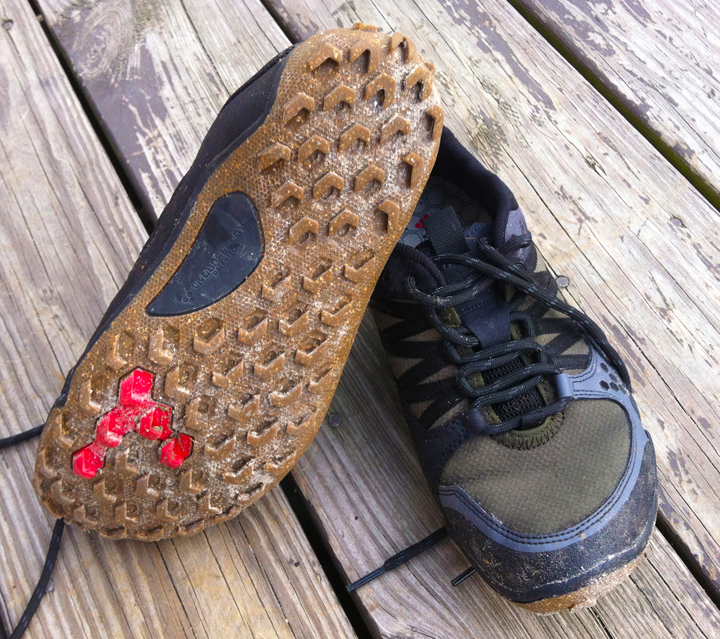 I did a comparison test on icy and snowy trails with my Merrells and these outperformed them for grip. They do dig themselves into the ground when you need it. 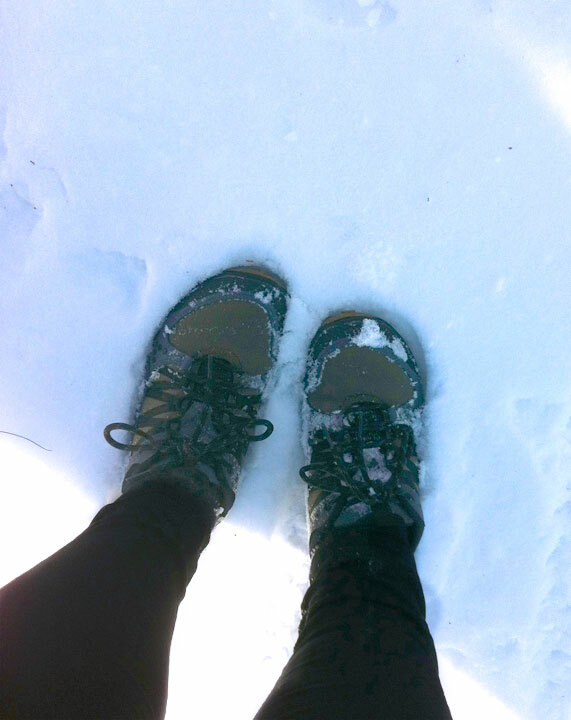 I agree with you about the warmth factor – summer is probably a no-go for these shoes. Like the Merrell Lithe gloves, when they get wet they stay wet – for a LONG time. 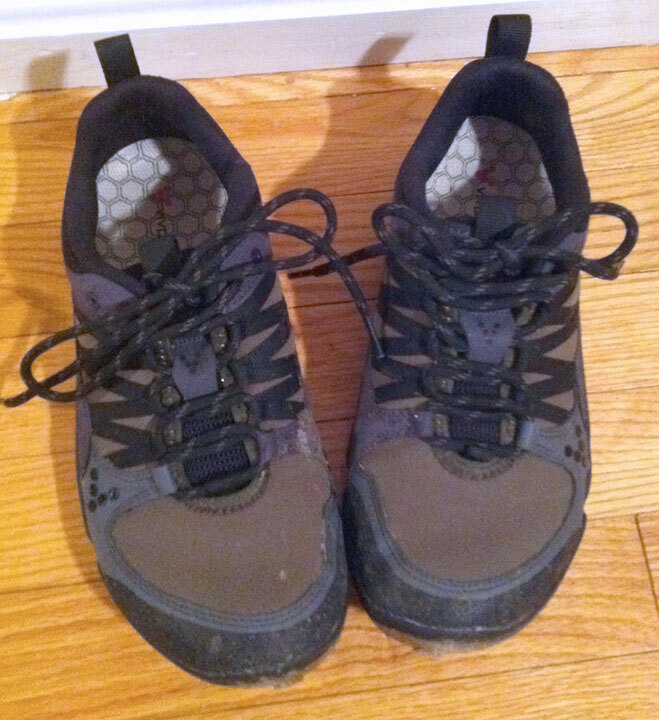 I did like the ground feel and thought that it was better than the Merrells. Although I loved the roomy toe-box, I did feel they weren’t tight enough across the mid-foot. 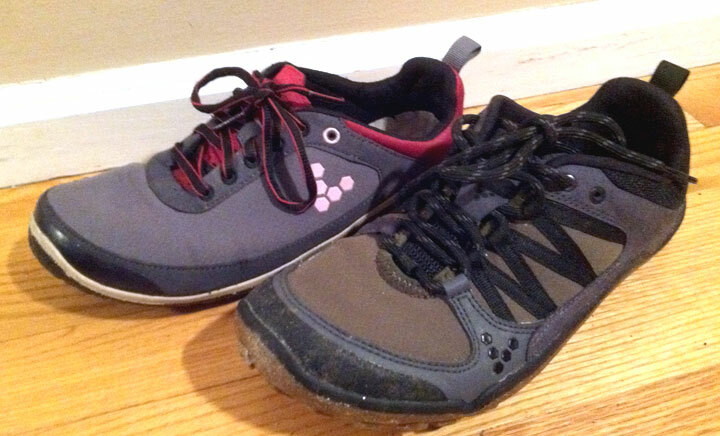 I think as fit goes you are either a Merrell or a Vivobarefoot runner. You either fit in one or the other. I would love the mid-foot security of the Merrells with the toe-box of the Neo’s. Not so much an issue if it was a road shoe, but as it’s meant for trails, this is probably a little concern when I hit the technical trail. Still playing with them to see if I can tighten them up some more. I am still testing them to see how they cope with on the roads – need a few more runs. They are the only VIVO’s I have, so I don’t have any others to compare them to. I have the pale grey and pink ones, which are a darn sight prettier. Have you had time to determine how your Neo Trails fare on hard surfaces, both in terms of foot comfort and durability of the sole and cleats? Thanks. 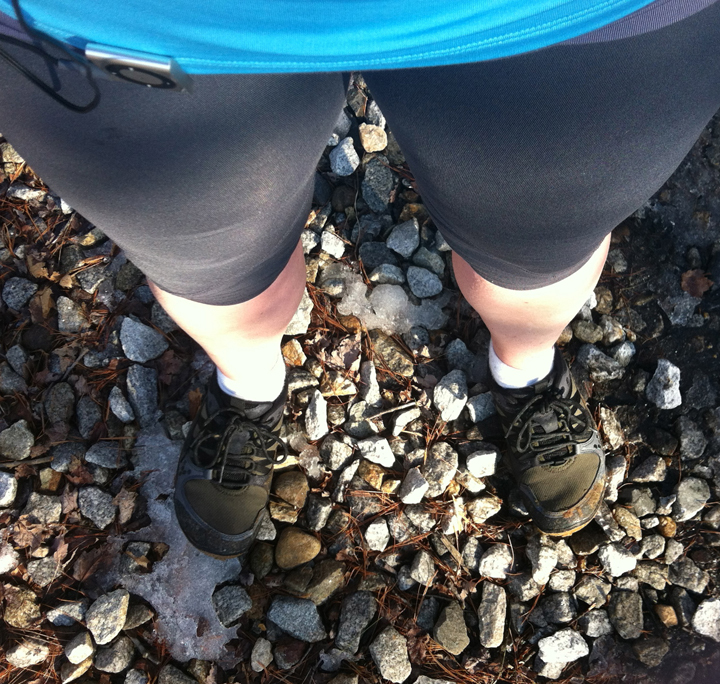 Kate- Can you tell us your opinion on how the Neo Trails have fared on hard surfaces? 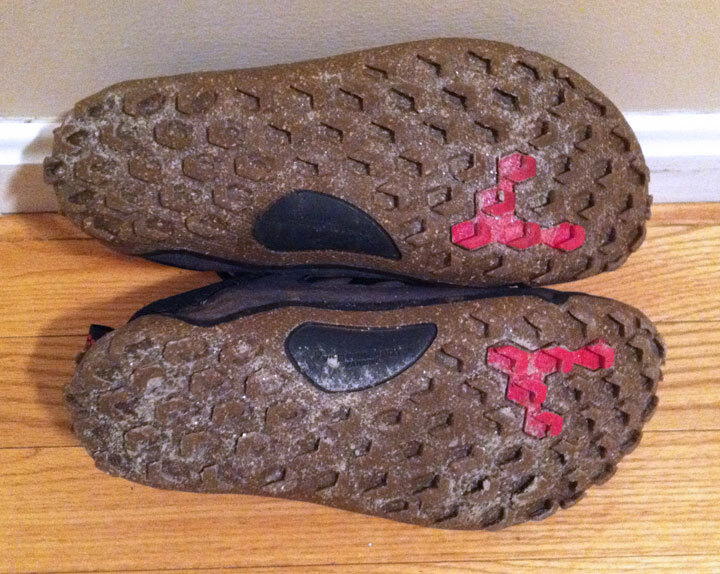 Did you notice any accelerated wear on the cleats or tread? And did you find the sensation of the cleats to be uncomfortable on concrete or asphalt? Thanks. This is a trail shoe and as such it’s not a comfortable shoe to run in when you hit concrete or asphalt. I did try a road run in them and after about 5 miles, my feet were pretty sore. After that point I managed to get hold of the Lucy Lites and they are a much better road shoe (and as you may expect they are lousy on trails). 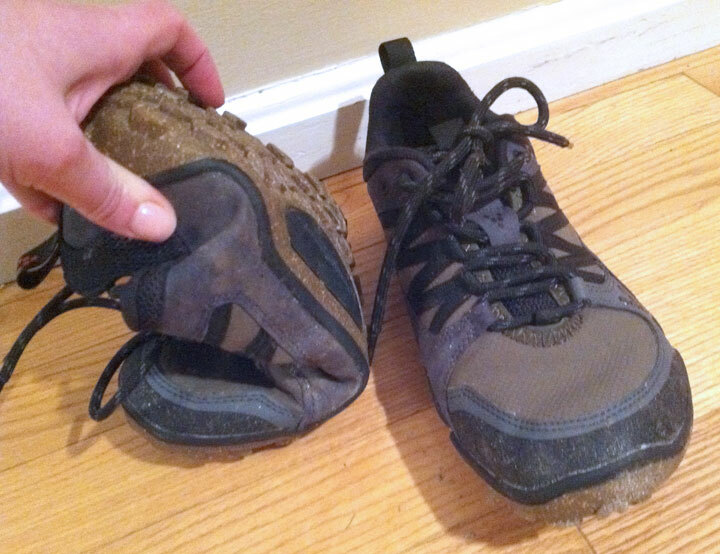 As the Neo Trails and the Breatho Trails (which I also managed to pick up) are a warm shoe. The Breatho’s are better for warm weather, but still warm. As such, the shoes have taken a back seat over the summer as I have been wearing huaraches, Vibrams and Merrells as they are a cooler shoe. So I haven’t run enough in them to notice much wear; also remember I am running on softer and more technical trail, so the wear wouldn’t be so harsh anyway. With the fall and winter coming I’ll be dusting them off and seeing how they fair with the new ranges coming up. SHould be interesting. these are my favorite shoe. the larger toe box is so much better than the Merrells I ran in all of last year. I have noticed that my feet are warmer than in my Merrell trail gloves, BUT not so warm that I’d be concerned about running through the summer. I’ll know more in a few months here in sunny california. Nice review. You nailed the finer points of this shoe. I have over 200 miles on mine and there is almost no wear in the tread. My Merrell’s seem to run down around the 250-300 mile mark so I’ll know more in March. Thanks for you review. Thanks for reading! I do really like this show for trails. Tey have made my trail fears go away. The tread really is great and I’m glad they made the design decisions they did over there. I am hoping I’ll get to try out a pair of the new Breathos soon, as a lighter, cooler alternative to the Neo Trail.